Aromatics are a special class of delocalized compounds. Benzene is the common example of an aromatic compound. Figure MO16.1. Ball-and-stick model of benzene. 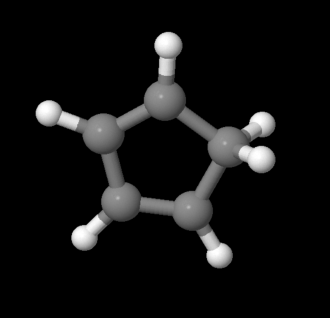 Lots of compounds in nature contain "benzene units" within larger structures. It is so common that it has gotten a great deal of attention over the years. 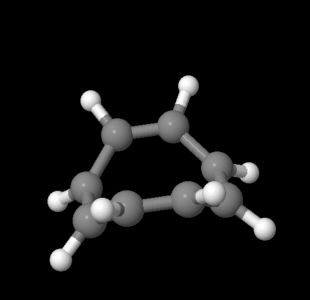 These benzene units are sometimes called "phenyls" or, more generally, "arenes". Benzene is a good example of a delocalized structure. It is something that could be studied using a Huckel MO approach. One of the pieces of experimental evidence that benzene has delocalized bonding comes from crystal structures. The first X-ray crystal structure of benzene was performed in 1929 by Kathleen Lonsdale. This experiment allowed Lonsdale to measure the distances between the carbons in benzene. A C-C bond in benzene is 1.40 Angstroms long. By comparison, a typical C-C bond is 1.47 Angstroms long, and a typical C=C bond is 1.35 Angstroms long. The C-C bonds in benzene appear to be somewhere between a double and a single bond, and they are all the same. They are not alternating, double-single-double as the Lewis structure suggests. Benzene has delocalized pi bonding. Despite what the Lewis structure says, all of benzene's C-C bonds are the same length. We can try to show that benzene's bonds are all the same by using two resonance structures. When we do that, we are saying that the real molecule behaves a little like one Lewis structure and a little like the other. Draw two Lewis structures that together illustrate the delocalization in benzene. In some ways, aromatics behave differently than other compounds with C=C bonds. For example, there are reactions that alkenes undergo pretty easily, but benzene does not. Bromine, Br2 adds easily across alkene double bonds. Ethene, or CH2=CH2, would add bromine to form dibromoethane, BrCH2-CH2Br. As a result, the red-brown colour of bromine disappears instantly if it is added to an alkene, because the bromine is rapidly consumed. Alkenes also react with hydrogen, H2. Hydrogen can add across double bonds to form "saturated hydrocarbons" (hydrocarbons that don't have any double bonds). Hexene, CH2=CHCH2CH2CH2CH3, could react with hydrogen to form hexane, CH3CH2CH2CH2CH2CH3. This reaction is a lot more sluggish than bromination, though. Bromination often happens instantly. Hydrogenating something takes a lot of work. In general, some kind of catalyst, like powdered palladium metal, must be added before anything happens, and the alkene must be placed under an atmosphere of hydrogen for a long time. Benzene can be hydrogenated (to form cyclohexane, C6H12), but it is even more difficult than usual. For a catalyst, palladium really won't do. This requires platinum or platinum oxide, which are a little more reactive. Also, high temperatures may be needed as well as high pressures of hydrogen (often several times greater than atmospheric pressure). Maybe benzene can be brominated if the right catalyst is added. Ferric chloride works, but it turns out a completely different reaction takes place. C6H6 turns into C6H5Br. All the double bonds are still there. The bromine atom just replaces a hydrogen atom. Benzene does not undergo the same reactions as other compounds with C=C bonds. In some ways, aromatics are more stable than expected. Historically, much has been made about benzene being a ring. When first isolated by Michael Faraday in the 1820's, people didn't have much idea about its structure, and what it might look like was debated for decades. 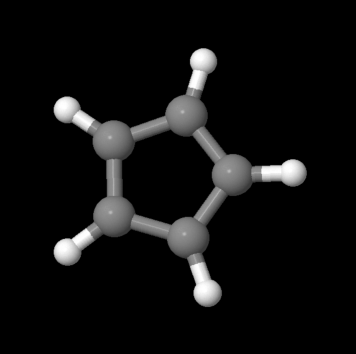 There is a story that August Kekule reported about nodding off in an armchair and dreaming of a snake biting its tail; he says he woke up and had the idea that benzene was composed of a circle of carbon atoms (confirmed by Lonsdale about 65 years later). Maybe the special ring structure of benzene lends it extra stability. Benzene is delocalized and cyclic. So maybe benzene's stability comes with having conjugation and being cyclic. But maybe that isn't enough, either. There are other compounds that are both delocalized and cyclic, but that do not display benzene's properties. For example, cyclopentadiene has long C-C bonds and short C=C bonds, and it behaves like an alkene. It is not aromatic. Why not? Maybe the difference is that cyclopentadiene does not have alternating pi bonds all around the ring. It does not have a conjugated p orbital on each carbon. There is a tetrahedral CH2 unit in between two of the double bonds. That tetrahedral carbon, or sp3 carbon, does not have a free p orbital it can use to make double bonds. Figure MO16.2. Ball-and-stick model of cyclopentadiene. Go to Animation MO16.2. 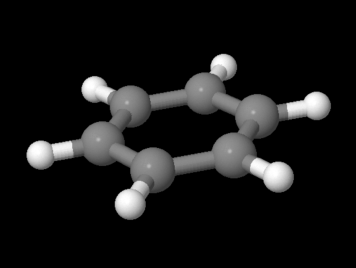 A three-dimensional model of cyclopentadiene. Benzene is fully conjugated, all the way around the ring. Not only is benzene cyclic, and not only does it display conjugation, but the conjugation goes around and around and around the ring in an endless pi bond. That must make it different from other compounds with C=C bonds. However, cyclooctatetraene is cyclic and fully conjugated, with four double bonds and four single bonds in an eight membered ring. Cyclooctatetraene behaves exactly like other alkenes. It gets hydrogenated and it gets brominated and it loses its double bonds. Figure MO16.3. Ball-and-stick model of cyclooctatetraene. Go to Animation MO16.3. A three-dimensional model of cyclooctatetraene. Cyclooctatetraene is a basket. You could hold fruit in it. Not only is benzene cyclic and fully conjugated all the way around the ring, but it's flat. Maybe that's important. After all, if it's flat, the p orbitals on adjacent carbons could line up right beside each other. They would be perfectly parallel, and they would have really good overlap. To be aromatic, a molecule needs all three of these characteristics. A very similar molecule should fit these criteria. Cyclobutadiene, C4H4 , would be cyclic, conjugated and flat. It should be aromatic and extra-stable, just like benzene. Figure MO16.4. Ball-and-stick model of cyclobutadiene. Go to Animation MO16.4. A three-dimensional model of cyclobutadiene. The trouble is, cyclobutadiene is incredibly hard to make. People spent years trying. When they finally succeeded in making it (or compounds that contained a cyclobutadiene unit), they could just catch a fleeting glimpse of it using spectroscopic methods. Then it was gone. It reacted as soon as it came into being. Cyclobutadiene is even more reactive than most alkenes (other compounds with C=C bonds). The spectroscopic techniques people used to detect cyclobutadiene seemed to give some additional information about it. Cyclobutadiene is not square; it's rectangular. Cyclobutadiene does not behave as if it has delocalized pi bonding. It doesn't seem to be conjugated. What's the difference? It's a simple question of numbers. Cyclobutadiene has an even number of pi bonds. It is not aromatic. It is called "anti-aromatic". 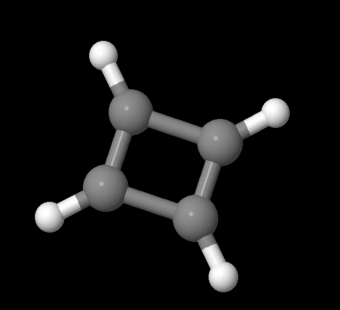 Benzene has an odd number of pi bonds. It is aromatic. A Huckel MO treatment of benzene and cyclobutadiene does reveal some differences. Before looking at that, we should see the way people often draw the p orbitals combinations on rings. Because people often have trouble drawing rings edge-on, they look at the ring from the top. If you look at the ring from the top, the p orbitals look like circles, because you can only see the lobe that is closest to you. That's much easier to draw. Looking at benzene from above, we get the following molecular orbitals (below). There are six p orbitals involved in pi bonding, so six MO combinations result. There is only one way to get all orbitals in-phase (either they are in phase or they are not). This combination has the most bonding interactions between neighbouring p orbitals. It produces a new MO that is all bonding. There is one, lowest-energy molecular orbital that has no nodes through the edges of the ring. The electrons in this orbital have a much more extended wavelength than they would in either a p orbital or a regular pi bond. There is only one way to get all orbitals out-of-phase (either they are out-of-phase or they are not). This combination has six nodes. It is entirely antibonding. Because there can only be even nodes in a ring (try drawing one in which p orbitals are out of phase in one spot but nowhere else), there can also be combinations with two nodes or four nodes. There are always alternate ways to arrive at these pictures, and there are always two of each of these combinations. The combination with two nodes is still mostly bonding. It has more in-phase interactions between neighbours than out-of-phase interactions. The combination with four nodes is mostly antibonding. It has more out-of-phase interactions between neighbours than in-phase interactions. Because there are only six pi electrpons in benzene (count them in the Lewis structure), all of the pi electrons are in bonding orbitals. They are delocalized. In cyclobutadiene, the orbital combinations work in a similar way. There is an all in phase combination and an all out of phase combinations. In addition, there are two ways of getting a combination that is equally in phase and out of phase. Note that, like in benzene, when there are multiple ways to represent a combination, one molecular orbital is usually represented to show both bonding and antibonding interactions. The other usually shows the net result, either just bonding or antibonding or, in the case of cyclobutadiene, no direct interaction between adjacent atoms because it is a non-bonding orbital. These two different representations are part of how two orbitals at the same energy level are ensured to be orthogonal to each other, just like two p orbitals on the same atom could be along the x axis or along the y axis, but not both along the same axis. They need to get out of each other's way. If delocalized, all the pi electrons in benzene are low in energy; they are bonding. However, in cyclobutadiene, only two of the pi electrons are actually bonding; the other two are non-bonding. What's more, the orbital diagram suggests two of the electrons are unpaired, a situation that usually makes organic molecules very reactive. It has been suggested that cyclobutadiene distorts into a rectangle to avoid this sitiuation. The energy level diagrams for cyclic, fully conjugated systems can be drawn very quickly using the Frost circle method. To use the method, draw a circle. Draw the shape of the cyclic compound inside this circle. One corner of the shape must be at the very bottom of the circle. You are going to add levels around the edge of the circle, one for each place where a corner touches the circle. The pi system refers to delocalized bonds formed from p orbitals that are perpendicular to the plane of the ring. In a Lewis structure, these may be obvious pi bonds, or they may be lone pairs or even "empty" p orbitals. Indicate which of the following compounds would be aromatic, anti-aromatic, or neither. Just assume they are all flat. The rules of aromaticity do not apply only to regular hydrocarbons. Sometimes, anionic or cationic hydrocarbons may have aromatic properties. As with benzene, the aromatic species have regular geometries all around, even though the Lewis structure suggests some of the carbon-carbon bonds are double and some are single. The cyclopentadienyl anion, C5H5-, is a common example. It is frequently observed as a ligand in transition metal complexes. Figure MO16.5. Ball-and-stick model of cyclopentadienyl anion. Go to Animation MO16.5. A three-dimensional model of cyclopentadienyl anion. Indicate which of the following cations would be aromatic, anti-aromatic, or neither. Just assume they are all flat. Indicate whether the following anions would be aromatic, anti-aromatic, or neither. Just assume they are all flat. Sometimes, hydrocarbons can be deprotonated (H+ removed by a very, very strong base) if the resulting anion is particularly stable. In the following cases, draw the anion that would result by removing a proton from a tetrahedral carbon, leaving behind a lone pair. Predict whether the anion would be especially stable. a) Draw a resonance structure of tropone in which there is charge separation (a cation and an anion). b) Which of the two structures shows aromatic character: the original one, or the one you drew? c) Hydroxytropolone was found to have more aromatic character than tropone. Draw a resonance structure to help explain why.